The courses and modules depicted in the Leadership as an Adventure Model can be integrated with a series of Adventures in the areas of equine (horses), land, and water. Because some adventures align better with specific leadership content, we can help you in selecting the appropriate adventure. Also, each of our Adventure themes can be tailored to suit the skills and physical ability of the individual or group. For example, an equine-related adventure theme for one group may utilize a horse in the leadership training, but the participants may not actually mount or ride the horse. For another, more equine-experienced group, the equine-related adventure may involve utilizing a horse in the leadership training and riding the horse each day. Whatever your adventure skill level or physical ability, we have customized each Adventure theme to meet the specific needs of the individual or group. 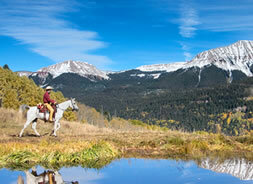 Equine-related adventures involve the use of one or more horses in the leadership adventure. Participants learn leadership skills through the adventure of a customized combination of being around a horse, preparing a horse to be ridden, saddling a horse, feeding a horse, walking a horse, and potentially riding a horse. The equine-related adventure may take place at a venue close to your local community, in a State or National Park or National Forest, or at one of our certified equine facilities. 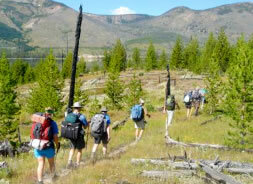 Land-related adventures involve the use of the natural land in the leadership adventure. Participants learn leadership skills through the adventure of a customized combination of walking on trails, overcoming obstacles on one of our certified Executive Leadership Trails, hiking, trekking, camping, climbing, high-courses (ropes), low-courses (trails). The land-related adventure may take place on land close to your local community or in a State or National Park or National Forest. Water-related adventures involve the use of the natural water in the leadership adventure. Participants learn leadership skills through the adventure of a customized combination of being around water (streams, lakes, oceans, etc.) 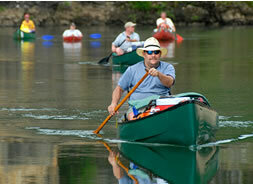 walking on trails involving water fords, fishing, floating via raft, canoe, or kayak, or white-water rafting. The water-related adventure may take place on water close to your local community, in a State or National Park or National Forest, at one of our certified rafting/floating courses, or a local swimming pool or diving tank.